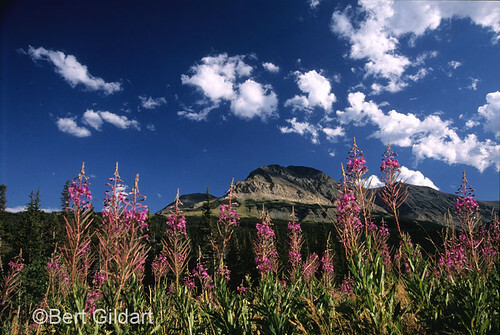 ©Bert Gildart: Though I worked in Glacier National Park for 13 summers (and a number of falls), three of the best seasons were spent in the 1980s as a back-country ranger at the Cutbank Ranger Station. The station was historic and had all the right vibes for me to write a weekly column about my work there for the local weekly back in Bigfork (the Bigfork Eagle). Come fall I’d return home and resume my work as an outdoor writer, producing a tabloid that won many awards from the Montana Press Association. Cut Bank Ranger Station, where I served for three summers. The trip Janie and I made this past week recalled a few of the wonderful memories from those years. To reach the old station this past Saturday, we drove four miles to a locked gate and then rode one mile by bike to the ranger station. My memories were made even more vivid when, lo, whom should we find de-winterizing the station but our neighbor Bill Hutchison, still an employee in Glacier. He let us in, and we poked around a bit. Then we wandered back outside again and looked at the old familiar setting. The station is set in the shadows of Kapukamint Mountain to the north and by Mad Wolf Mountain to the south. To the east once ran the old and historic North Trail, providing another lure for anyone with outdoor interests. Later, when we walked down to the old barn, memories flooded in. The best way to provide some picture of what my life was like at the old cabin is to reprint one of my old columns. This summer, we hope to do even better and visit with the current ranger at Cut Bank. And then, too, there are several more columns I’ll soon be running here. But first, a column about the trails radiating from my station, and all that one can learn when one stays alert. Sometimes it’s much more than one might expect. From the Bigfork Eagle, June 1981: Trails from Cut Bank Ranger Station lead (eventually) in four different directions. As a back-country ranger it is my job to patrol each of these areas and, in the jargon of the park service, “to stay alert and be prepared for the unexpected.” In the course of an average day that means I am supposed to remain in such a state for almost 20 miles or approximately eight or nine hours. The mode of transportation used most often for these patrols is horse. During the course of a single summer, “John” (the horse) and I traveled hundreds of miles. Typically, a day’s outing along trails to the south include a patrol to Medicine Grizzly Lake (approximately five miles one way) followed by a trip to Morning Star Lake (another five miles). The return route then is about seven miles for a grand total of about 17 miles. Occasionally, I may extend these trips and proceed toward the east, terminating my trip at Triple Divide or, taking anther fork, terminating my trip near Pitamakin Pass. Both areas offer unique geological and historical features. The trail over Triple Divide eventually takes me to Red Eagle Lake and then, five miles further, to St. Mary Ranger Station for a grand total of 24 miles. Once, in an unusual spurt of masochism, I hiked the entire length in a single day. The fork to the southwest proceeds toward Pitamakin Pass. Here, if one were to continue, there would be several options: one, proceed back to the north and drop down toward Old Man Lake. Then, continuing, complete your trip arriving eventually at Two Medicine Campground. As still another option, hikers may proceed from Pitamakin Pass taking what once was an old Indian Trail into the Nyack Wilderness area. 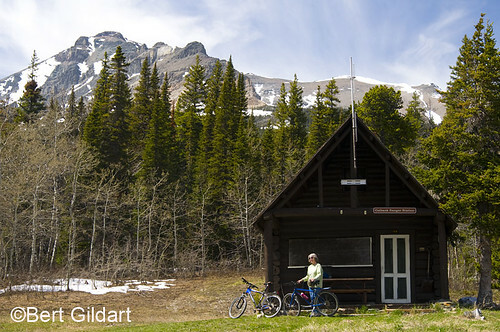 This part of GNP offers hikers the opportunity to camp in undesignated areas. No other area of Glacier provides this opportunity. And what if hikers camp in unauthorized areas? Part of my job is to insure that this doesn’t happen, but occasionally it does, and if the Cut Bank Ranger catches offenders, why he can issue them a ticket. Like one day two weeks ago. Word had drifted back via hikers that a party of four was camped just below Pitamakin Pass at Lake of the Seven Winds. To make sure they would not get away, I arose at four in the morning and was at the above-mentioned lake just as the sun was peering over the frosty peaks. There they were, right in the middle of bear country–ground dug up all around them. In fact they were not far from the very area we had closed last year to prevent further bear/people confrontations. To top it off they had a fire blazing. Four healthy-looking men, with an illegal fire. Not a female among them to alter my disposition. So I done my duty, recalling, of course, that the dispensation of a ticket should be an educational tool, and moreover (according to park philosophy) that it should be administered with such tact and finesse that a violator might even want to send me a Christmas card. If I were to ride in the other direction looking from my ranger station, I would soon be on the Blackfeet Indian Reservation. A few of the Indians here have leased their land to whites, who in turn, graze their sheep and cattle. Occasionally, these animals find a break in the boundary fence and slip through onto park land. In an effort to maintain good public relations with ranchers who really do work at controlling these beasts, I have ridden out to each of these spreads meeting as many of the hands as possible. It was in this manner that the Cut Bank Ranger was able to solve the case of a missing person for the tribal police. Mad Wolf Mountain, which can be accessed directly from the ranger station. Only last week one of the hands working out of a seldom-visited line-camp decided to drop by my ranger station with an exceedingly charming lady. By their actions, I judged them to be very good friends. Several nights later, the tribal police stopped by and asked me if I had seen the gentleman in question; that he had been missing for several weeks. Of course, I was glad to help and responded that, “Yes, they had been by the ranger station and, furthermore, that there had been no problems–that he was traveling with a most charming and certainly well-meaning young lady.” Continuing, I even said that I hoped he was in no trouble with the law. My, but I do learn a lot by riding the trails and staying alert. 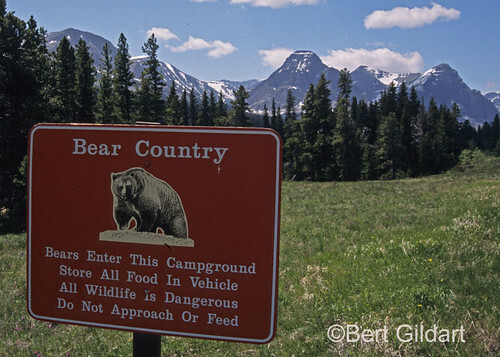 This entry was posted on Wednesday, May 21st, 2008 at 7:24 am and is filed under Glacier National Park, Natural History/Conservation. You can follow any responses to this entry through the RSS 2.0 feed. You can leave a response, or trackback from your own site. My father Harrison Goodall just sent me this link. Although being very young at the time it is a moment in life that I will never forget. Camping in a tent for months every summer at differn’t parks and projects. Hope everyone is all well and you still have your Hasselblad. I sold my Hasselblad system about three years ago. I did so with much anguish as it had served me so well and I had amassed such a wonderful collection of images. I kept it simply because I liked having it around. However, almost everything I do now is digital. What’s more, several years had passed since I actually put it to use, so I sold it (for more than I paid for it) and reinvested in scanners, and several top of the line digital Nikon cameras. I still have a 4×5 system, but that too may go as the detail available through Photoshop techniques is simply amazing. Seems like many things change as we go through life, but I’ve got to say that Cut Bank still looks just about the same. In fact, I bet that Chaunce Beebe, the first ranger to occupy the ranger station, might feel right at home. That’s in large part due to the wonderful restoration work your dad and his crew performed 29 years ago. If you’re out this way, look me up. Are you all still in New Jersey? I was part of that wonderful crew with Harrison and his son Dean. But could it really be 29 years ago? It was my first taste of ‘the west’. You were such a big help for me because I was the nut who liked to hike a bit. By guiding me to the right spots you made me see more beautiful places of that park than one could imagine. One of the main reasons I write blogs is that they sometimes attract interesting people from my past. I’ve hear, incidentally, from Harrison and his son. Cut Bank was the height of my years as a ranger, and I visit the old station at least once a year. Several years ago I climbed Mad Wolf, that mountain that you see as you’re standing on the ranger station porch. Technically, it’s not difficult, just a long days grunt. Thanks for writing! And maybe we’ll see you some day in Glacier. Hey Bert I was part of the restoration crew with both my friends mike and a very young Dean Goodall. The days spent in the very magical place named Cut bank will forever live in my heart and my dreams. This was a place where dreams came true, not Iowa. If by chance you have any photos of that summer I would love to have the copies. We were all young men and women then with great dreams but nothing came close then that magical summer with all of us sharing one dream. Best reguards and lets not forget the man that continues to make it happen Harrison.